SEATTLE (Scrap Monster): The Association of Postconsumer Plastic Recyclers (APR) has called for responsible recycling of discarded rigid plastic containers. By doing so, grocery stores and supermarkets could reduce their waste. At the same time, recycling of rigid plastics would also generate revenue, APR noted. According to Scott Saunders, Chairman, APR, the “behind-the-counter” rigid plastic containers from grocery stores are in high demand. Studies conducted across multiple grocery stores and supermarkets revealed that the bakery, deli, seafood and pharmacy sections generated rigid plastic container in the range from 80 pounds to 150 pounds every week. 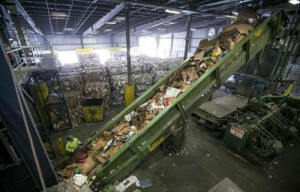 APR urges grocery stores to make this material available for recycling. As these containers are already separated and generally clean, they could generate considerable revenue. Earlier in 2013, the Association had introduced a comprehensive recycling initiative named ‘Grocery Store Recycling Program’. The program is aimed to green their operations-both financially and environmentally by recycling various grades of rigid plastics including high density polypropylene (HDPE -#2) and polypropylene (PP-#5) trays, pails and covers. Bailing rigids can produce new revenue through volume marketing. APR sees tremendous potential for the above program and expects it to grow dramatically in the coming years. The Association of Postconsumer Plastic Recyclers (APR) is the national trade association representing companies who acquire, reprocess and sell the byproduct of more than 90 percent of the postconsumer plastic processing capacity in the U.S., Canada and Mexico. Membership includes independent recycling companies of all sizes, processing numerous resins, as well as consumer product companies, equipment manufacturers, testing laboratories, organizations, and others committed to the success of plastics recycling.